Produced by SBCA, BCSI is the truss industry's guide for jobsite safety and truss performance. This 8.5" x 11" edition (3-hole punched and spiral bound) includes the most current information regarding the handling, installation, restraining and bracing of metal plate connected wood trusses. BCSI includes information and guidance pertaining to diagonal bracing for web members with two rows of lateral restraint, as well as permanent lateral restraint and diagonal bracing guidance for trusses spaced wider than 2' o.c. To order, visit SBCA's online catalog. Also check out CFSBCSI for cold-formed steel trusses. 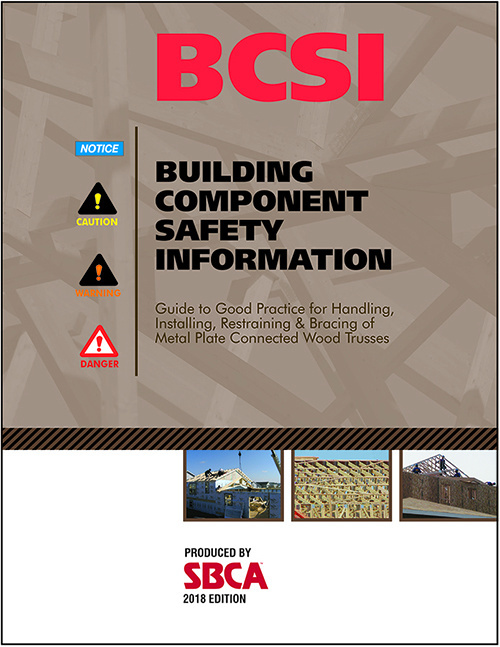 An introduction to the BCSI book for guidance information on handling, installing, restraining and bracing of metal plate connected wood trusses. Visit SBCA's Online Catalog to learn more and to purchase the full BCSI book. Each summary sheet condenses a chapter of the BCSI book. These economical packages include key handling and installing information. JOBSITE PACKAGES are available in a variety of formats for wood components, steel components, wall panels and floor trusses. SBCA's Cold-Formed Steel Council (CFSC) has developed a CFSBCSI book, summary sheets and a CFS JOBSITE PACKAGE. BCSI Canada includes Canadian references,installation tolerances changed to align with local practices, and design related tables consistent with Canadian design standard.